In this piece Shari WIlcox reflects on the value of animal studies to her own work which spans geography, anthropological fieldwork and animal advocacy. Much in the spirit of Richie Nimmo’s thought provoking post on this blog, my essay is not intended to be a tidy narrative that hangs together in a well-constructed story of professional origin and identity. Rather, I have opted here to share one story that explores a bit of the messiness of scholarly work, intersections with our animal subjects, and the value of Animal Studies as interdisciplinary academic space. Prior to graduate school, I was employed with a wildlife conservation NGO that worked primarily through policy advocacy and legal intervention to mitigate human-wildlife conflict. While these experiences were valuable, throughout my time with the organization I was left wanting for a way to gain perspective on our work, as much of what I saw around me felt unacknowledged and unexplored. Working amongst conservation practitioners and policy experts, the animals at the heart of our mission felt somehow divorced of their animality—bodies and symbols by-proxy became physical and symbolic pieces on an immense political chessboard. There appeared to me to be an overt effort at detachment and a reticence to acknowledge attachments and affections that motivate individuals in this work; a desire to cloak these personal affinities in the interest of professional distance and scientific objectivity that felt as though it left a gulf of uncharted terrain. I went to graduate school in search of ways and means by which to examine my experiences through a different lens, and to find the animals that were obscured within these anthropocentric social, political, and economic constructs. I wandered into Animal Studies as a graduate student in Geography, having had the opportunity to take a number of animal-focused courses on campus. I recognized the rapidly growing and evolving body of literature to be a more useful frame for exploring my own interest in the messiness of human perception and representation of wildlife species than the more traditional “human dimensions” approaches. At the time, Animal Studies was itself truly an emerging field, and in my own discipline Animal Geography was regarded largely as a lark—a “B-side” topic for a scholar to explore in their free time. Fortunately, although this was new territory for him as well, my advisor was supportive of following the path less followed, encouraging me to transgress disciplinary boundaries and find my place within those expanding territories. While in the process of writing my dissertation on the history of human-jaguar entanglements, my advisor encouraged me to begin with a narrative. “Tell the story,” he urged. But which story? I was caught off guard: here was an opportunity to explore this grey area, acknowledging one’s own presences, motivations, and connections within one’s own study and relative to one’s subjects. This was not typically the province of our discipline, where personal narratives tend to be cloaked, glimpses of individual subjectivities peeking out through a methodological choice or a passing footnote. My personal connections and emotional affiliations lay below the surface, intertwined, unexamined, and yet present in each decision I made in the field, the ways in which I structured my research, my methods, and my writing. I jotted down a placeholder title for that initial section “Jaguar, Interrupted” early in my writing process, as I stared at the empty page. It seemed cliché but it also resonated, and so there the title remained alone on the page. Behind this singular page, the others filled in: animals, people, history, biology, culture. Narratives were constructed through space and time as theoretical scaffolding took shape, connecting the pieces and containing the empirical data within. Still, the title and a question mark were all that remained on the first page. I came to realize as I wrote that ultimately this dissertation was about jaguar lives interrupted—by death or capture at the hands of fearful, inquisitive, or overzealous humans. Of course, it was not only through capture and killing that jaguar lives intersected with the lives of humans. Jaguars are affected by humans in complex, intricate ways that we are still coming to understand: habitat degradation, impacts on prey species populations, and global climate change have all interrupted jaguar lives, as individuals and entire populations change their habitat selection, geographic ranges, dietary preferences, and behaviors within these shifting paradigms. 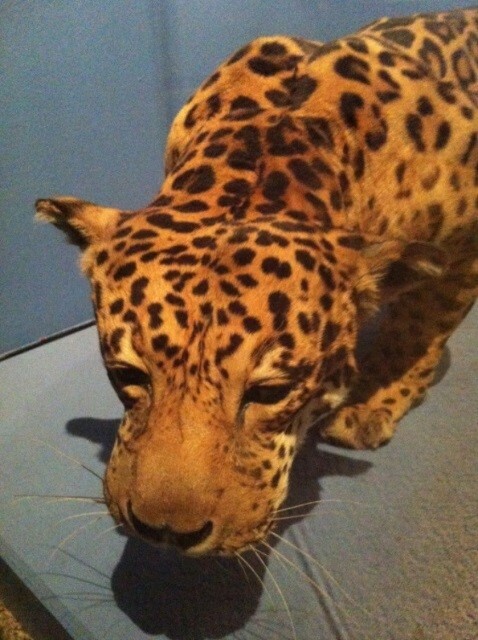 Sitting on the floor of the Witte Museum in San Antonio one spring morning nose-to-nose with a taxidermized jaguar who once roamed the central Texas landscape, I could not shake the thought that my work was littered with the bodies and memories of dead jaguars. From historical accounts to contemporary encounters, these jaguars died as a result of encounter with humans. I became increasingly interested in the thought of encountering el tigre, and finding within this narrative not only jaguar deaths, but jaguar lives. This realization ultimately took me back into the field and into the verdant jungles of Belize, famous for one of the densest jaguar populations remaining on the planet. In this place, I had the opportunity to move through jaguar inhabited habitats, the cats themselves being far too elusive to typically encounter in the wild. 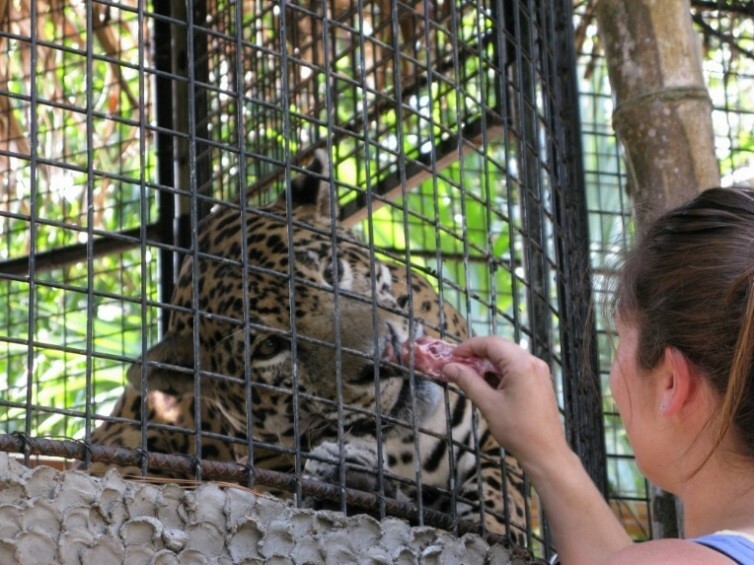 In Belize, I also experienced my own jaguar encounter, not in the wild but within the surrogate habitat of the Belize Zoo. In this location, “problem” jaguars who find themselves in conflict with human communities are relocated to captive held situations as a part of The World Conservation Union (IUCN) Species Survival Plan (SSP). Rather than being killed for their predatory natures, these transgressive cats live in captivity, contributing through their physical presences in zoos to outreach and education programs while also gaining some level of immortality through participation in captive breeding programs intended to ensure the long-term genetic viability of rare and threatened species. While visiting this program, I had the opportunity to interact with one jaguar, an individual well known in Belize named Pat. Unexpectedly, I encountered the same jaguar a few years later far from the tropical climates of Belize, on a cold grey day at the Milwaukee Zoo in Wisconsin. While on a behind-the-scenes tour, the zoo keepers excitedly informed our group that a jaguar had just arrived from Belize. I had heard this name before: Pat the Cat. I stared at this incredibly unhappy cat, shocked by its journey and change in conditions: far from a verdant jungle, removed to a sterile concrete cell. I looked at the cat’s coat, and I thought about how jaguar spot patterns are as unique as fingerprints. I consulted my records later—this was indeed the same jaguar. With a shifting of site came a shifting of situation for Pat: he was physically, symbolically, and theoretically relocated, from predatory pest to a keeper of genetic material and a public figure for outreach and education. This cat had transgressed many boundaries: as conflict jaguar transgressing socially constructed boundaries through acts of predation on domestic stock; being physically relocated from wild to captivity; and from living a life of jaguar-y agency to fulfilling roles constructed by humans by participating in conservation breeding. In these zoological spaces, I found live jaguars, encounter-able jaguars. This same jaguar was abstracted from its own former existence, its “value” now defined by its biological realities rather than its jaguar-ness. 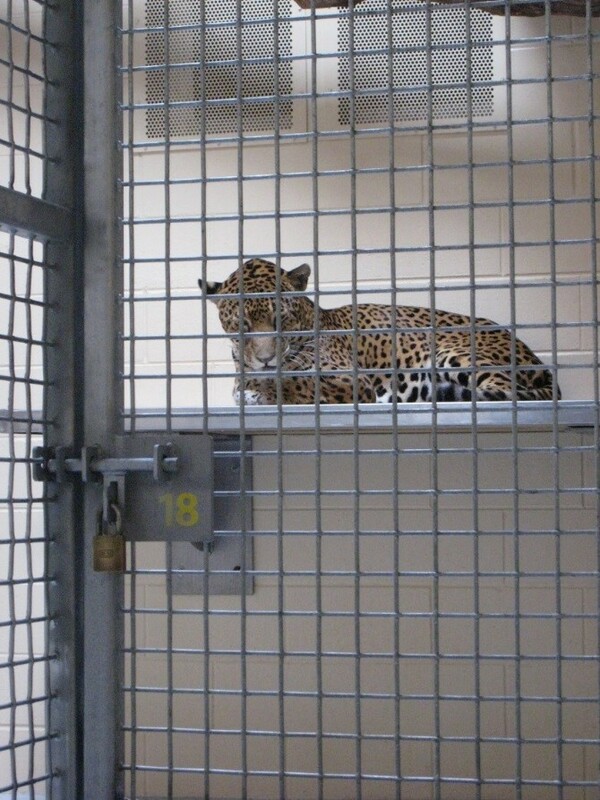 In some ways, Pat’s captivity represents the opportunity for the creation of new jaguar lives. This one interrupted jaguar life may create opportunities again for wild jaguars, as subsequent generations may be part of a reintroduction program into their former range, re-appropriating habitat that was once jaguar space. However, the entire experience left me unsettled. While this outcome seemed a good compromise, a way to preserve life within anthropocentric concern, I could not help but wonder: would the jaguar have selected this fate? For the individual jaguar, is this a fate worse than becoming a stuffed object stored in a museum case? And so, to end this meandering essay- why Animal Studies? Animal Studies offers the room to think more carefully and critically about the ways in which our lives intertwine and intersect with animal subjects in meaningful ways. While we need the impartial language and methods of science, we must also color between those lines and acknowledge human-animal co-being. Animal Studies has for me opened theoretical frameworks and provided methodological tools for better thinking around and through messy, complicated real-world entanglements I encountered, finding ways to understand the contact points between my own deeply held, messy, partially articulated motivations, affections, affiliations and my professional engagement both as a scholar and conservation practitioner. Shari Wilcox is Associate Director of the Center for Culture, History, and Environment in the Nelson Institute for Environmental Studies at the University of Wisconsin-Madison and holds a Ph.D. in Geography from the University of Texas at Austin. Her research is concerned with cultural perceptions of terrestrial mammalian carnivores and the ways in which representations of species influence formalized and informal systems that impact the lives of these animals. Her current research considers reintroduction and rewilding strategies involving cat species in the United States and the United Kingdom. She is currently completing her manuscript provisionally titled Jaguars of Empire: Natural History in the New World and co-editing the volume Historical Animal Geographies. 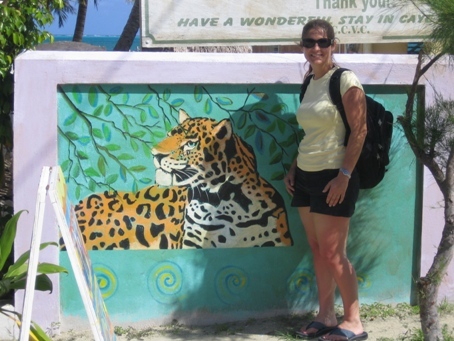 Shari is a founding board member of the Animal Geography Specialty Group of the American Association of Geographers. You can find Shari at https://nelson.wisc.edu/che/ and www.sharonwilcox.info. This entry was posted in series: 'why animal studies?' and tagged animal conservation, animal geography, Animal Studies, conservation, human-animal studies, jaguars, wild animal advocacy, wild animals by Nik Taylor. Bookmark the permalink.